In what must surely be some kind of elaborate money laundering scheme, "artist" Richard Prince is selling print-outs of screengrabs of other people's Instagram photos as art. 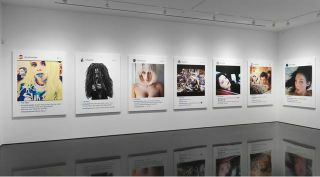 On display at the Gagosian Gallery in New York, the shots (which come replete with a comment from the "artist" himself) are also on sale for around $100,000 each. Neither the original photographers nor the people in the photos will get so much as a dollar out of Dickie Prince, though; he has fought and won lawsuits for "appropriating" existing works before on the basis of fair use.